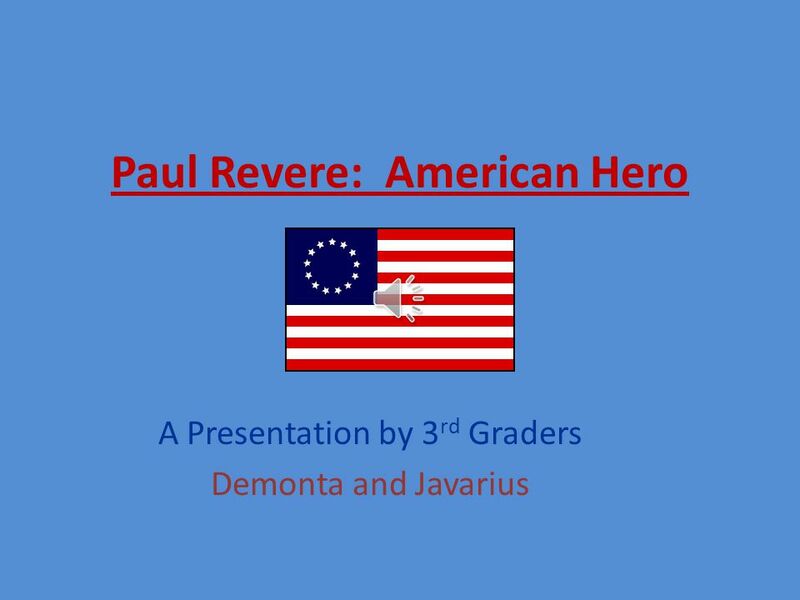 Paul Revere: American Hero A Presentation by 3 rd Graders Demonta and Javarius. 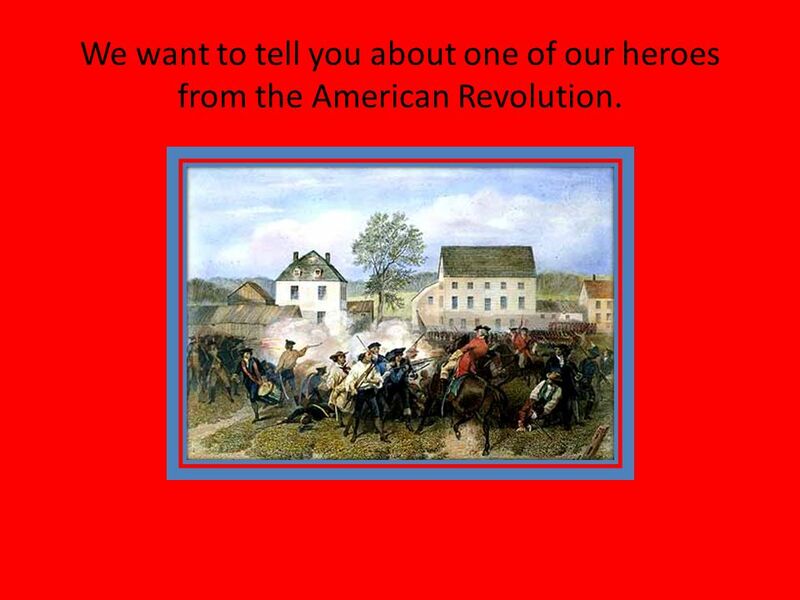 2 We want to tell you about one of our heroes from the American Revolution. 3 His name was Paul Revere, and he worked as a silversmith. 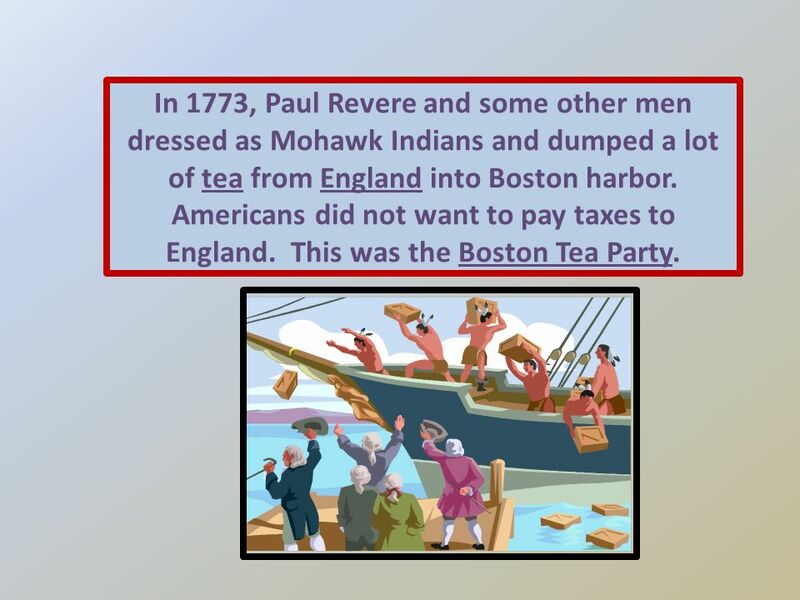 4 In 1773, Paul Revere and some other men dressed as Mohawk Indians and dumped a lot of tea from England into Boston harbor. Americans did not want to pay taxes to England. This was the Boston Tea Party. 5 The Americans and the British became so mad at each other that a war began. Paul Revere rode a horse to different towns in Massachusetts to warn the Americans that the British were coming. 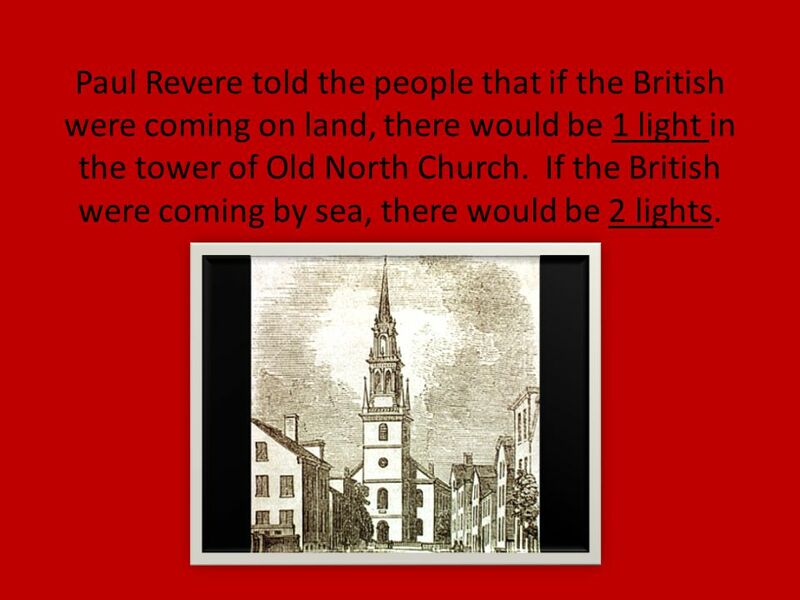 6 Paul Revere told the people that if the British were coming on land, there would be 1 light in the tower of Old North Church. If the British were coming by sea, there would be 2 lights. 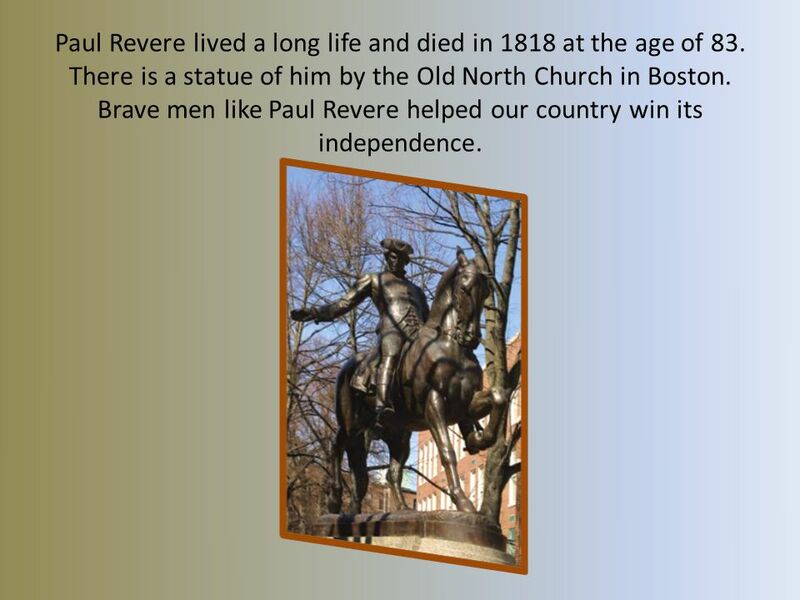 7 Paul Revere lived a long life and died in 1818 at the age of 83. There is a statue of him by the Old North Church in Boston. Brave men like Paul Revere helped our country win its independence. 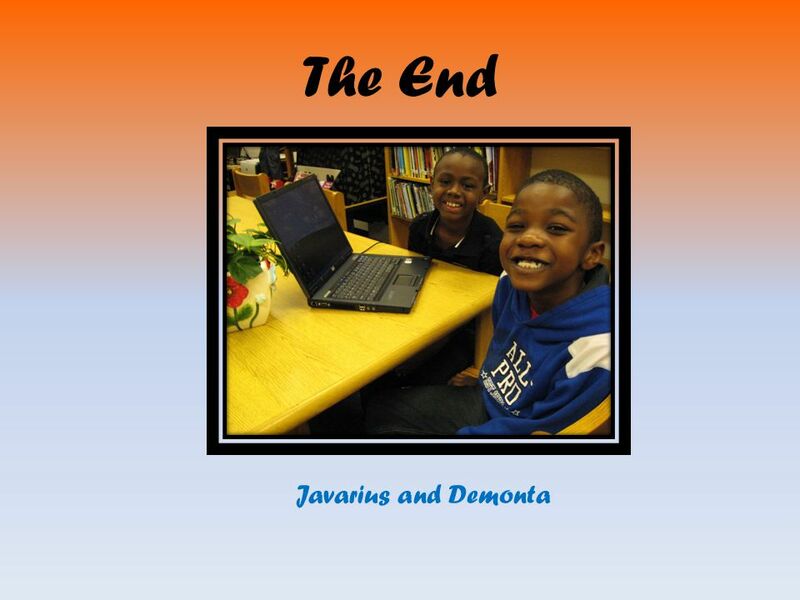 Download ppt "Paul Revere: American Hero A Presentation by 3 rd Graders Demonta and Javarius." Let’s Play “Who’s The Man?”. 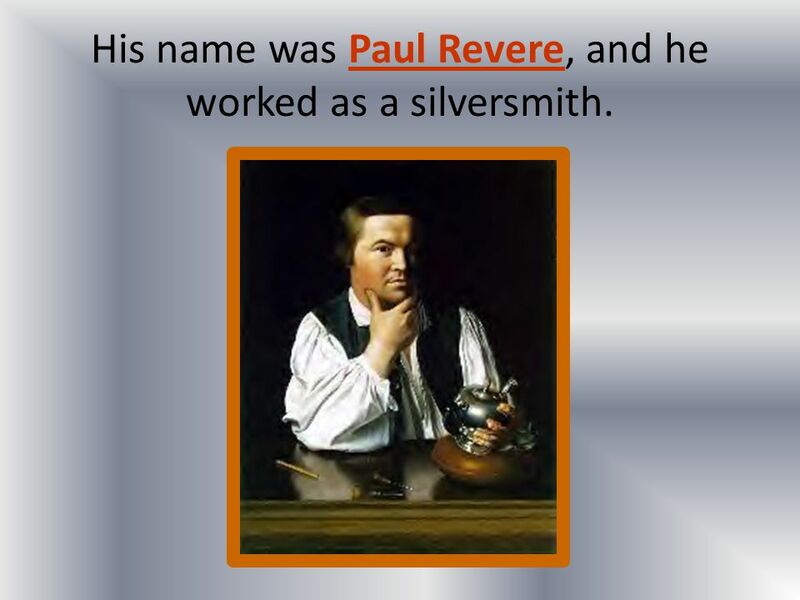 Paul Revere By Sarah Voskamp Paul Revere was a silversmith. An American hero?.  He was born in 1735 and died in  He was born in Boston, Massachusetts.  His father was silversmith. Taxation and Acts The British brought taxes to the colonist because winning the French and Indian war cost a great amount of money. These acts had to. 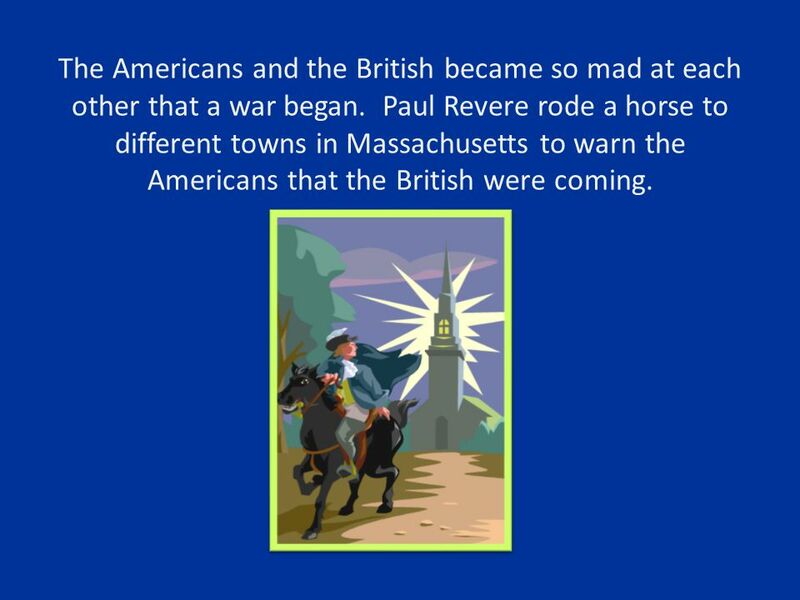 Midnight Ride of Paul Revere Fact vs. Fiction Who Was Paul Revere? B. January 1, 1735 D. May 10, 1818 Silversmith from Boston--a very good one Drew Political. Paul Revere’s Ride By Helen Werntz Forest Acres Elementary School November, 2001. Paul Revere Essential Question How do I discuss the lives of historical figures who expanded people’s rights and freedoms in a democracy? The Importance of BAH-st-ten (That’s Boston for most of us) How and why Boston was at the center of the Beginnings of the American Revolution Presentation. Paul Revere By: Chase Everson. 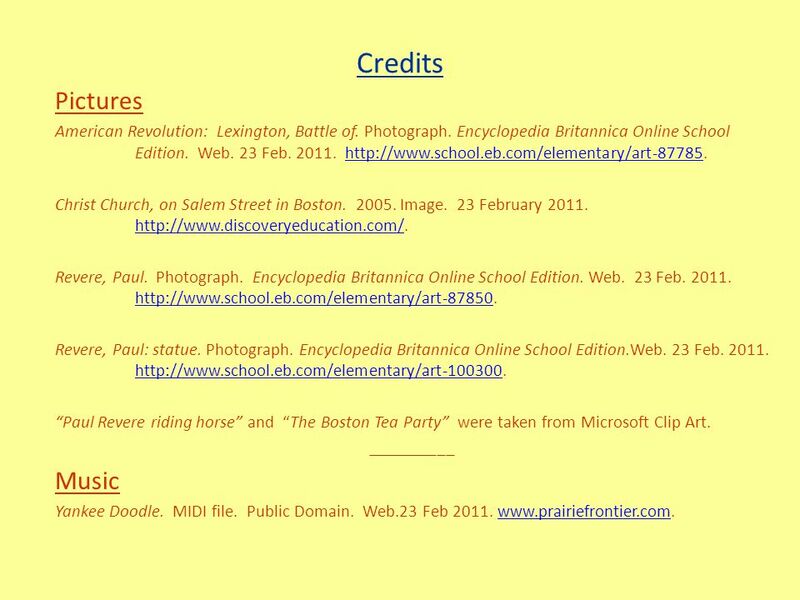 What Made Him/Her Famous On April 18,1775 Paul made his most famous ride. He warned patriots that the British army was. Paul Revere American Patriot. Purpose of Lesson Standard: SS3H2 – The student will discuss the lives of Americans who expanded people’s rights and freedoms.